by Rabbi Gedaliah Aharon Kenig zt''l - founder of Nachal Novea community in Tsfat and foremost Breslev leader of the previous generation. The sukkah is associated with King David. It is thus called the ''Sukkah of David''. It could have been called by another name, like the ''Sukkah of Israel'' or the ''Sukkah of Moses'', yet our sages connect sukkah to David haMelech. The fourth evening of the holiday of Sukkot marks the yahrzeit of Rebbe Nachman of Breslev, who is referred to as the nachal novea mekor chochma - ''the flowing river, source of wisdom'' [Proverbs 18:4]. He proclaimed an astounding concept to the world: ''There is no such thing as despair!'' Nothing in the world is beyond hope. Yet Rebbe Nachman asserts: ''There is no such thing as despair!'' Although it is impossible to avoid difficult situations, the mind possesses a special power that can prevent one from falling completely during hard times. On Sukkot we pray: ''May the Compassionate One raise for us the ''Fallen Sukkah of David''. Conceptually, the Sukkah of David represents a spiritually cleansed mind connected to a higher spiritual level, a place beyond our own intellectual perception of the world. According to the kabbalah, the sukkah represents the levels of perception beyond the conscious mind called makifim or ''external intellect''. In contrast, pnimim or ''internal intellect''' is the knowledge we have successfully acquired. These two levels are dynamically related: when the higher intellect enters our mind enabling us to understand it, the new insight becomes encompassed within our internal intellect. The physical universe and everything that occurs within it, is part of the lower level of the World of Action, and connected to the kabbalistic sefira of malchut. Malchut itself possesses a type of ''intellect'' expressed as the animating intelligence contained by everything in the world. This intelligence corresponds to King David and the lower internal intellect mentioned earlier. The crown of King David, however, symbolizes the higher surrounding intellect, corresponding to the concept of sukkah. When we don't understand why things are a certain way in the world, the power of faith should be exercised. Faith draws down the highest light into any situation. If you believe that there is a G-d Above Who governs the world, you won't dismiss something as meaningless just because you don't understand it. On the contrary, despire your current inability to understand, you will know everything is functioning according to a Higher Plan which is just and fair. This faith will then illuminate your entire reality. In every situation, you now connect the upper surrounding intellect, called sukkah, to the lower internalized intellect, corresponding to your current perception of how the physical world operates. When you believe that whatever happens is governed from Above, it is clear that it is good. Even if I am sitting in darkness and don't understand what is happening, if I nonetheless believe that everything is just and fair because it is supervised by G-d, then this faith is a light for me. Despite the darkness, it does not even occur to me to despair, since the same governing Power that brought me here to this situation or state of mind will do everything for my good and ultimately take me out of this darkness. Through this expression of lower intellect, you will now attain the higher intellect, called sukkah. The merging of these two intellects is called the ''Sukkah of David'', which occurs when your perception of the way the world operates [Malchut David] is joined with the upper surrounding intellect [sukkah]. The opposite occurs when the two are separated, a division caused by thinking everything is under the jurisdiction of nature and human agency. ''David'' is separated from sukkah - our perception of this world is separated from the upper intellect, faith in Divine governance of the world. This state is called ''The Fallen Sukkah of David''. Thus, when Rebbe Nachman says ''There is no such thing in the world as despair'', he is drawing down the highest light into the human heart to give us the ability to understand that regardless of the difficulties we experience, there is a higher Power in charge of every detail in the world. The process of attaining this level of understanding is called ''raising the fallen sukkah of David''. Sukkat David is the rectified state of mind where the upper and lower intellect are united. G-d created us in order to know Him. How is it possible for a limited physical human being to know G-d, Who is Infinite? It is only possible to know G-d through facing the difficult challenges in life, and strengthening ourselves to get through them. 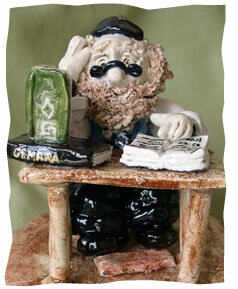 During times when it is extremely difficult to find G-d, one may fall, since it seems that G-d doesn't exist. The difficulty of the search itself brings one to a state of nothingness. By strengthening oneself during these moments, the very obstacles which prevented perception of G-d can be transformed into a vessel for Divine light. One begins to sense G-d's direct supervision over every detail. Anything that seemed unjust or unfair is now understood as being orchestrated in a wondrous way for the good. Only by passing through darkness and obstacles can we draw closer to G-d, which is a fulfilment of the Divine will. Sometimes during difficult times we say ''Oy! This is too much! I've had enough obstacles and darkness! I'm finished!'' This way of thinking is erroneous, since we were not created to remain on a single level. On the contrary, we were created to continually ascend from level to level. Difficult situations are necessary in order to progress and come closer to G-d. The message of Rebbe Nachman is that it shouldn't even occur to a person to despair and think ''I can't go on''. Strengthen yourself over and over again, and eventually you will make it through. There is always a limit to difficulties because G-d doesn't leave us in difficult straits forever. The only purpose of obstacles is to create a vessel to receive light. Material obstacles and the vessels they can create have measure and definition. However, G-d's light is unlimited. We need only to strengthen ourselves and not give up. Sometimes one becomes so weak in the last moment and loses everything. This is a shame, since at that very moment a vessel is being completed to receive a higher light. At the end, the darkness can become so overwhelming that we think we are lost and give up completely, G-d forbid. Constantly strengthening oneself is the secret to our existence. There is no book in the world that can tell the entire awesome story of what the Jewish people have undergone since inception. Yet, despite everything, we continue to exist. This is only because of our patience, trust and will to strengthen ourselves anew each time, despite constant suffering. We will continue to develop, and with the help of G-d, we will exist until the end, when the purpose for which we were created will be fulfilled. To know the unlimited light of the Infinite One. Rebbe Nachman is proclaiming to the entire world a message that everyone must hear. There is no such thing as despair! There is no situation beyond hope! The Jewish people have always found themselves in difficult situations, and today is no different. Instead of losing hope, we must strengthen ourselves with perfected faith, especially during the days of Sukkot, when we bring our entire physical being into the sukkah. We will then be worthy of being illuminated with a new light, which will reestablish the ''Fallen Sukkah of David forever''. Amen. Gmar Chatimah Tova - Literally: A good final sealing. Idiomatically: May you be inscribed [in the Book of Life] for Good. "Gmar" comes from the root word that means to finish. Although it's not biblical, it appears quite a bit in the Talmud [Avot 2:16 Yevamot 12:6]. Chatimah is also talmudic and can mean a signature or a sealing [Pessachim 104]. The word "chotemet" or stamp [the ink kind, not the postal kind] is a derivative of "chatimah." Of course "tova" means good. The days of repentance are divided into two parts: The first the inscribing begins on Rosh Hashana and finishes Yom Kippur when the final "sealing" [chatima] of our fate takes place. Many sages give us a second chance - an extra 12 days until a really final sealing on Hoshana Rabba [the 7th day of Sukkot]. That is why many people finish their correspondence during this time of year by writing or saying Ktivah V'chatima Tova - "may you be inscribed and sealed for a good year." 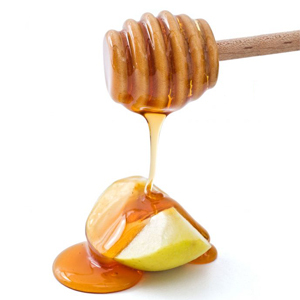 On or right before Yom Kippur, people modify that and wish "Gmar Chatima Tova." Technically you can say it means 'may your finished sealing be good' - which would be fine if you are redoing your apartment, but for the rest of us may you all have a healthy peaceful and fulfilling year. I'm listening to some extremely interesting audios - Everything is a Message from G-d - by Yishai Beckow, and if you have the time, I highly recommend visiting his blog and tuning in. I recently had an email discussion with Yishai, on the topic of Moshiach and the various dates that are often predicted on different websites. I think the current '''date'' for everything changing is Hoshanah Rabah, according to some bloggers. We've heard so many different dates, and they all turn out to be non-events - at least insofar as the appearance of Moshiach is concerned - and subsequently we may find ourselves becoming fed up with the process and losing all hope, when we believe the hype surrounding a particular day in the near future, and nothing happens ! Re: Ge'ulah - it is a process, not a single event. There are many steps and stages we need to go through. It won't happen instantly, and is still happening. Don't expect to see one night a certain world and the next morning a different one. We need to go through everything. Soon enough, I think you will see that this process actually started a long time ago. Probably with the burning of Yosef's kever, which was either 2000 or 2001. But it is so complex and so many things need to happen, we don't see the forest for the trees. The final stage will quite literally be overnight. And our davening etc right now IS working. It just takes a lot of work and momentum to overcome the inertia of Galus, and puts a strain on those of us who tend to over-work, and who are very focused on this issue. But by the time we will have been through so many different things, we will know what is happening. Right now, it is only the opening rounds, so to speak. So it IS happening. Just not on the time frame you or I might wish. That said, it's a big world, with lots of people. H' has to work out the best way for every person put together, which makes it not something any one person's calendar dictates. Don't give up, and don't stop davening. If you are interested in a discussion of the process, R' Tatz' Messianic Era discs are excellent. There is a comment from the Baal Shem Tov on the times preceding Ge'ulah: he says it will be as thought H' ties a big rope around the world and is shaking it vigorously. Those of us whose emunah is not strong enough will fall off. We need to hold onto the rope for dear life. That is how I already feel, and I suspect you do too. Don't let go. No matter how crazy life is or gets, the reality is that things are not out of control. We are all here now for a reason, and none of us are expendable. Nor are we expected to enjoy the painful parts. If we can hold on, we can also hold others on, and do much good. I think in the end, H' will show us that by helping others we are helping ourselves, and that the reason for the bleak outlook is to enhance the merit of having remained loyal. And remember "if I didn't fall down, I couldn't get up." 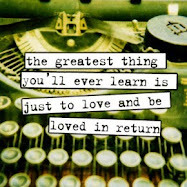 It happens to all of us -.....We get back at it slowly. Mitzvah gereret mitzvah - one mitzvah leads to another. Start somewhere, and you'll see it comes back together. While it is oozing downwards, quickly lift the apple until the shaft breaks. The upward climbing honey gives us a moving message for the new year. Even if you have fallen, you can always climb back up. Even if you have become disconnected, you can reconnect. You may have become estranged from your people and from your G-d. You may have lost your way in life and fallen to a very low place. But you can always pick yourself back up. No force in the world can stop a Jew coming home. The honey may fall downwards, but at a certain point it turns around. In fact, it is the falling down that causes the bouncing up. The further you have strayed from Judaism, the more rebound energy you have built up for your return. A Jewish soul wants to be Jewish. Materialistic distractions can only hold us back for so long. Our inner pull towards G-d is stronger than the pull of gravity towards the earth. Honey always bounces back. So can we. The hallway leading to Jacqui Taub’s apartment in Ramat Beit Shemesh, Israel, is wallpapered with whirls of deep purple and cream. The walls of her apartment are covered with her paintings: a sea ebbs in hues of purple, mauve and lilac; a young girl meanders through a garden of pastel flowers; two men and a little boy lean against the Western Wall. The oil paintings are a blend of gentle, consistent forward motion. As Jacqui puts aside her walking stick and eases herself into her chair, I witness the physical pain that she has to contend with from multiple hip replacements and spinal surgery. Yet her vivacious eyes twinkle with an energy that belies her sixty-five years. Her rich Australian accent fills the room as she takes me back to her childhood in Sydney, through her marriage and subsequent divorce, her discovery of her talent for poetry, art, and ceramics, and finally on to her remarriage and life today. As reflected in her paintings, her journey has been one of consistent onward motion. While her parents initially maintained cordial relations, their friendship came to a halt when her father remarried eight years later. “My stepmother was wonderful, but I still longed for my biological mother,” Jacqui says, recalling this tumultuous period. When she was sixteen, she left school to attend secretarial college. Eventually, after two of Jacqui’s children moved to Israel, she too immigrated, and soon found herself in an absorption center in Raanana in central Israel, attempting to adapt to a new country and a new language. To add to the unbelievable stress, existential questions also began to bother her: “I was fifty-four years old, with absolutely no idea what my life’s purpose was about,” she says. “I wondered if we were here just to live and then die, and this led to my questioning the existence of G‑d.” What kept her going at this terrible low? “Quite simply, I had to earn a living,” Jacqui says. “Even though I knew my father would always be there for me, and I wouldn’t starve, I just wasn’t prepared to give up.” With these words she reveals her true mettle: the ability to forge forward against the odds. This strong belief in herself as an artist pushed her forward to market herself in a foreign environment. Jacqui had first ventured into the field of art through writing. In her thirties, she had published a few children’s books of what she calls “nonsense poetry,” and a series of children’s books that were published and distributed nationally in Australia; a London publisher included some of the poems in an anthology. She also wrote and illustrated Judaica nonsense poems for children, which are waiting to be published. One delightful poem describes a little boy watching a pair of his tzitzit fly up and away, only to land on the shoulders of another little boy who isn’t wearing tzitzit. Jacqui’s perseverance paid off, and so began the G’sundheit Collectables. 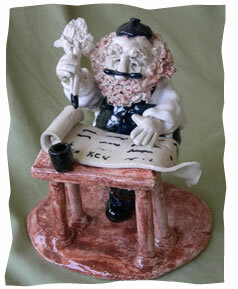 G’sundheit means “good health” in Yiddish, and is used to wish the blessing of good health upon someone. While Jacqui didn’t realize it at the time, she was in fact in desperate need of a blessing for good health—both of her hips and her spine were deteriorating. At the absorption center in Ranana, in an attempt to support herself, Jacqui began once again to work on her G’sundheit Collectables. 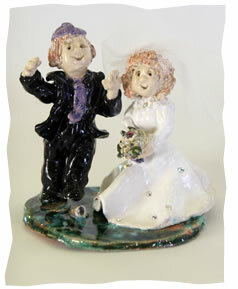 She spent the mornings working on her clay figurines, and the afternoons in Tel Aviv working as a secretary. She had to start from scratch, because every single one of the figurines that she had so carefully packed in cushions and pillows before leaving Sydney had arrived shattered. Luckily, she could fall back on her indomitable spirit! 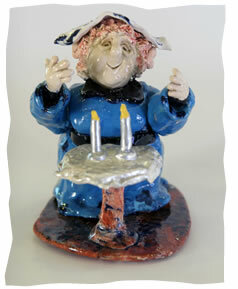 To fire the figurines, she had to drag them in plastic drawers across a field to her friend Marianne Davidow’s kiln. “About six weeks after I arrived in Israel, I set off for Jerusalem with my G’sundheit Collectables loaded in my old overnight bag on wheels. I dragged myself up Ben Yehuda Street and down to the Cardo in the Old City, my bag bouncing merrily along the cobblestones and my back aching horribly.” Although she didn’t know it at the time, the pain in her back was an ominous signal that surgery was imminent. “I sold everything,” says Jacqui, smiling, as she relives the pleasure of her first sales. The answer came in the guise of a shiny green book. “One day I went into a Jewish bookstore. I was looking for something, anything, to help me get past this confused state. I put my hand on a shiny green book all about prayer. This book was to change my life and my way of thinking. It was all about the amidah, a prayer of nineteen blessings that we recite silently. There was an introduction that explained the way we should approach prayer, and a translation of the Hebrew words into English. Suddenly the amidah was no longer ‘that prayer during which you didn’t talk.’ Here was a chance to talk to G‑d.” As Jacqui learnt about the power of prayer, she was able to include G‑d in her day-to-day life. Perhaps one of Jacqui’s biggest challenges was waking up to the fact that her artistic talents are gifts from G‑d and not a direct result of her own singlehanded endeavors. “I finally understood to whom I owe gratitude,” Jacqui says. “By seeing my talents as a gift, I was able to take my ego out of other parts of my life too, and I changed. Jacqui’s desire to develop the spirit and humor that encompass Judaism inspired her to develop new ideas—the Hareidim G’sundheits. So if you see a miniature of a rabbi in a shtreimel, with a long black coat and his tzitzit hanging out, playing golf, tennis or cycling, you can be sure that you’re looking at one of Jacqui’s creations. When the back pain that Jacqui had first noticed as she dragged her bag of G’sundheits through Jerusalem worsened, she went to the doctor and was diagnosed with avascular necrosis (AVN) in her right hip. Since the bone tissue wasn’t receiving blood, the tissue was dying and the bone was collapsing. In 2001, Jacqui underwent her first total hip replacement. However, the procedure wasn’t entirely successful: her hip actually dislocated four times. Each dislocation meant undergoing full anesthesia to relocate the hip. Eventually, the hip was revised in England. Nine years later, Jacqui underwent hip replacement surgery a second time: this time, her left side was operated on. As if that wasn’t enough, a year later, due to very severe spinal stenosis, Jacqui’s spine collapsed and she had to undergo spinal fusion. Prior to the surgery—although she had to spend three weeks in bed—as one would expect of her, Jacqui pushed onwards, and actually did manage to attend one meal at her grandson’s bar mitzvah. Today, Jacqui lives with pain, and she has elevated cobalt levels from the metal-on-metal prosthesis of her Birmingham hip, which will need constant monitoring. Coming full circle, Jacqui combines a life of art with a life of spirit, and of course she finds the impetus to surge forward.